Donning two dozen blonde wigs, the co-ed a cappella group Treble Makers revealed its newest project—the first a music video made by any Emerson a cappella group. Treble Makers hosted an open mic and concert, called “Treble Makers Go Blonde,” leading up to the video premiere on Feb. 26. The group’s two co-presidents, Carina Allen and Madeleine Beimford, both happen to have blonde hair, so the group decided to honor them by wearing blonde wigs for the entire event. Thomas Cooper, a visual and media arts professor and a cappella advisor for all groups, said this is the first official, full a cappella music video at Emerson he is aware of. 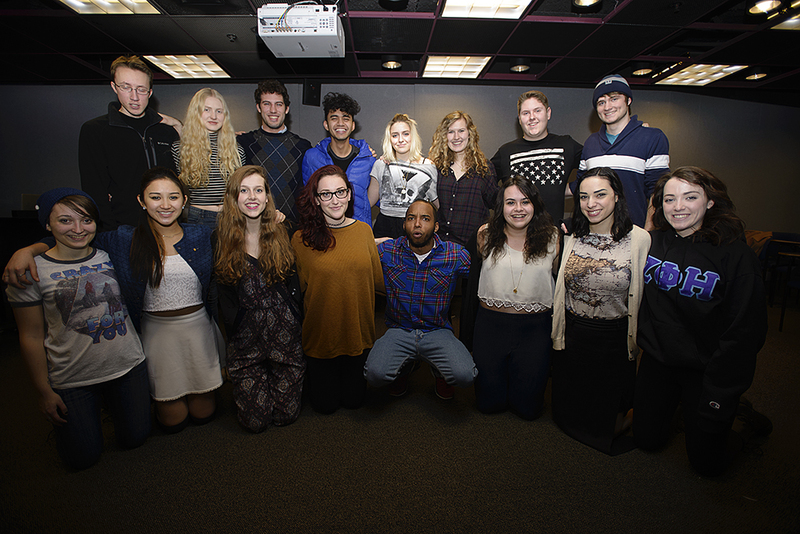 The idea for the video arose after senior Brandon Cardwell, a live mixer for WERS, offered to record the group singing “Skinny Love,” originally by Bon Iver, after hearing them perform it live on the station. The group wanted to do something different with its recording, and thought of a music video, Allen said. The music video opens with Allen, who was the lead singer, running her jewelry-clad hand through tall weeds in a meadow. The group coincidentally discovered the meadow on the way back from filming another scene. Twelve additional members are seen throughout the video. The majority of shots were filmed at an abandoned house in Quincy that the group rented from a local photographer familiar with Allen. With a somewhat neutral, muted color scheme and contrasting lighting, the music video gives off an indie, folksy aesthetic. The crew responsible for the production was composed entirely of Emerson students. With their connections among current and former Emerson students, Allen said costs were kept to a minimum. The main expense was renting the Quincy house, which was taken out of a donor account. Marketing costs were taken from Student Government Association funds, and group members paid for their own transportation. The producer of the video, sophomore Joann DiBuono, is Allen’s childhood friend and suitemate. The directors were Dustin Tan, a sophomore visual and media arts major, and Logan Koerner, who transferred out of Emerson after filming ended. The event for the video’s premiere began with a live Treble Makers performance of “Stay the Night,” originally by Zedd and Hayley Williams. They then opened the stage to nine other performers who had signed up for the open mic. Besides singers, there was a magician and a beatboxer, Daniel Friedman, from fellow a cappella group Achoired Taste. Friedman, a freshman visual and media arts major, said his group intends to create a music video also. “We’ll definitely take some pointers and ideas from [Treble Makers] in terms of how they were able to mix music with the video and still come off with a style that looked and sounded good,” Friedman said. Beimford said she and Allen love open mic events because they allow students of all majors to come together and enjoy music. After the open mic, the music video was played for the first time to the crowd of 90. At the time of publication, the video had over 1,500 views on YouTube.